Currently, reconstructions of past changes in the hydrological cycle are usually qualitative, which is a major drawback for testing the accuracy of models in predicting future responses. Here we present a proof of concept of a novel approach to deriving quantitative paleohydrological data, i.e. changes in relative humidity, from lacustrine sediment archives, employing a combination of organic geochemical methods and plant physiological modeling. This paper focuses on the relationship between Arabian Sea biological productivity and the Indian summer monsoon in climates of the last 72 kyr. A general circulation model coupled to a biogeochemistry model simulates the changes in productivity and monsoon intensity and pattern. The paradigm stating that a stronger summer monsoon enhances productivity is not always verified in our simulations. This work highlights the importance of considering the monsoon pattern in addition to its intensity. Here we introduce the Code for Ocean Drilling Data (CODD), a unified and consistent system for integrating disparate data streams such as micropaleontology, physical properties, core images, geochemistry, and borehole logging. As a test case, data from Ocean Drilling Program Leg 154 (Ceara Rise – western equatorial Atlantic) were assembled into a new regional composite benthic stable isotope record covering the last 5 million years. We present the first detailed description and sedimentological analyses of an 80 m permafrost sequence exposed in a mega-thaw slump near Batagay in the Yana Highlands, Russia, and attempt to deduce its genesis. First dating results (14C, OSL) show that the sequence represents a continental climate record spanning from the Middle Pleistocene to the Holocene. We suggest that the characteristics of the studied deposits are a result of various seasonally controlled climatically induced processes. All firn densification models applied to deglaciations show a large disagreement with δ15N measurements at sites in East Antarctica, predicting larger firn thickness during the Last Glacial Maximum, whereas δ15N suggests a reduced firn thickness compared to the Holocene. Here we present modifications, which significantly reduce the model–data mismatch for the gas trapping depth evolution over the last deglaciation at the coldest sites in East Antarctica, to the LGGE firn densification model. This contribution integrates new data on the main components of organic matter, geochemistry, and stable isotopes for the Cenomanian to Coniacian stages of the Late Cretaceous, along a north–south transect from the Cretaceous Western Interior Seaway to the equatorial western Atlantic and Southern Ocean. Distinct palynological assemblages and geochemical signatures allow insights into palaeoenvironmental conditions and water-mass evolution during this greenhouse climate period. 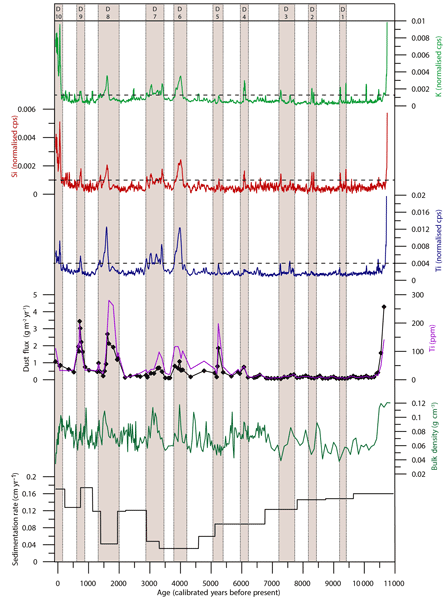 Results from Lago Edita, central-western Patagonia (47° S), allow examination of the timing and direction of paleoclimate signals during the last glacial termination (T1) in southern midlatitudes. Cold and wet conditions prevailed during T1, terminated by warm pulses at 13 000 and 11 000 yr BP. Delayed warming, relative to sites along the Pacific coast, raises the possibility that residual ice masses in the Andes induced regional cooling along downwind sectors of central Patagonia during T1. We present measurements of the gas composition in trapped air bubbles in ice samples taken from Taylor Glacier, Antarctica. We can show that ice from the entire last glacial cycle (125 000 years ago to the present) is exposed at the surface of this glacier and that the atmospheric record contained in the air bubbles is well preserved. Taylor Glacier therefore provides an easily accessible archive of ancient ice that allows for studies of trace components that require large ice volumes. We investigated how the Antarctic climate and ice sheets evolved during a period of warmer-than-present temperatures 4 million years ago, during a time when the carbon dioxide concentration in the atmosphere was very similar to today's level. Using computer models to first simulate the climate, and then how the ice sheets responded, we found that Antarctica most likely lost around 8.5 m sea-level equivalent ice volume as both East and West Antarctic ice sheets retreated. As N2O emissions were present in preindustrial times, only the difference between current and preindustrial emissions represents net human-induced climate change. Large uncertainty exists in previous estimates of preindustrial N2O emissions from the land biosphere. Our estimate using process-based model was the first study that provided the preindustrial N2O emission at the biome, sector or country, and global level, which could be a useful reference for future climate mitigation.